I like to ride bikes and cycled to work both summer and winter for many years. It’s good exercise, cheap and also good for the environment. However, it is quite uncomfortable and a little bit dangerous, at least in winter. With studded tires and rain gear it works quite well ofcorse, but it‘s not always so funny. I have long wondered if it wouldent be possible to make a more comfortable, safe and weather prof bike. The first idea was inspired by alpine sitskiers; a two-wheeled recumbent bik e with a movable support wheels for each arm who could help balance the bike, but I never got it to work well. It feels like you are a little bitt to weak in the arms for it to work well and feel safe. The experiments ended with me built a three-wheeled recumbent bike with two front wheels and one rear. This one I drove for a couple of years until I started working further from home. It then became too long and sweaty to ride the slightly heavy tricycle. 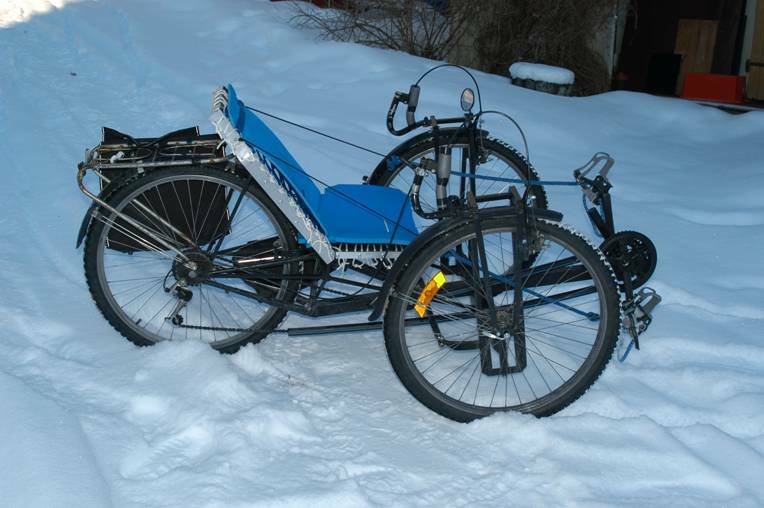 The next test was to build a two-wheeled recumbent bike, it was easier and faster and worked well during the summer. But it instead became too unstable and difficult for winter cycling. Next test was a purchase of an electric bike with a 250W electric motor integrated in the rear wheel. It went both easily and quickly and was really funny. But when you go faster it´s also colder and slipperyer especially in winter. It felt better than the two-wheeled recumbent but still sketchy. Based on the conclusions above and my experiences I have constructed a new craft. It is a four-wheeled recumbent bike with cloth body, suspension and auxiliary electric motor. I chose four wheels instead of three although it gets a little heavier, so as to make it as small and thin as possible. I think this fact is crucial to use the existing bicycle routes and for storage, parking and transport with other vehicles. 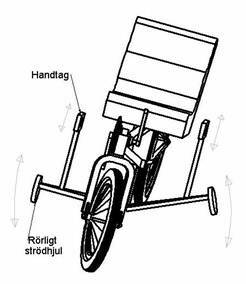 The sitting position should be like on a recumbent bike to get a comfortable chair and to bring down the center of gravity. The seat height should be that of a passenger car to see and be seen in traffic. The body is made of fabric on a frame of aluminum tubing and plastic windows. It will be a both light and inexpensive solution that also can be easily manufactured in different versions: sporty, elegant, cute, cabad, and so on. but with the same base plate.